SPAC's Junior Philharmonic Orchestra, JPO’s musicians experience superb orchestral and chamber music instruction from Sacramento’s most respected professional musicians and gain the confidence and responsibility necessary for a successful future. Being a youth orchestra that is truly regional, JPO has members from over 70 public and private middle to high schools from the Sacramento Valley Region as well as health professional students. JPO’s musicians are offered unparalleled experiences and performance opportunities that are rarely available to young musicians. As a pre-professional training orchestra, JPO is non-union, serving as a bridge, or transition between school and a career in music. 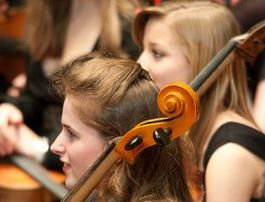 The age range of the orchestra extends from Fifteen through twenty-five years of age. 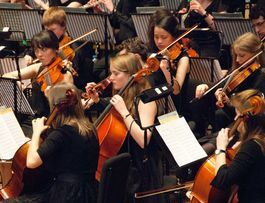 What distinguishes JPO from the other pre-professional training orchestras? Tuition-free for all accepted musicians. JPO offers paid fellowships to all members. All concerts are designed to benefit charitable organizations. 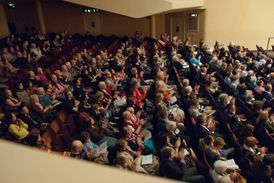 Those who pass the competitive audition round are awarded multi-year contracts: two-year contracts for winds and percussion and three-year contracts for all strings. Musicians may re-audition when their contract expires as long as they are under the age of twenty six. Those who are not selected as members of the orchestra are either put on a substitute list or rejected. Those on the sub-list are often called in when members are unavailable to perform. Secondary school musicians must be enrolled as active participants in their school music program to be eligible for participation in JPO. JPO brings world-class entertainment right to your backyard this October! San Francisco concerts: Benefit George Mark’s Children’s House. Sacramento concert: Side-by-Side performance with the World Doctors Orchestra. Featuring 200+ piece orchestra of JPO members and musician physicians from over 50 countries. Benefits the Shriner’s Children Hospital of Northern CA. Our rehearsal staff consists of professional coaches, conductors, interns from the Los Rios Colleges, and The AmeriCorps Volunteers. If you need assistance, please approach anyone of these persons. We are here for you!